Nestled deep in an Ozark valley and beside Roaring River Spring can be found one of the oldest fish hatcheries in the state. First constructed in 1910, the Civilian Conservation Corps later rebuilt it during the 1930's. The hatchery produces and stocks more than 250,000 rainbow trout each year and most end up right here in the 1.6 miles of trout stream that lie within the boundaries of Roaring River State Park. Each year, more than 100,000 people come here to fish the crystal clear water. But there is much more to see and do at Roaring River. After a trip to the trout stream, take a hatchery tour, feed the fish, or sit in on a nature presentation. And during the summer, local musicians put on a free bluegrass show every Friday night at the amphitheater. Grass cutting is scheduled for April 3-4, May 14-1`5, June 25-26, Aug 6-7, and September 17-18. Zone 1 From the hatchery to the posted sign at the mouth of Dry Hollow Creek, only artificial lures, soft plastic baits and flies are permitted. An artificial lure is defined as a manufactured lure. Soft plastic lures include synthetic eggs, worms or grubs. 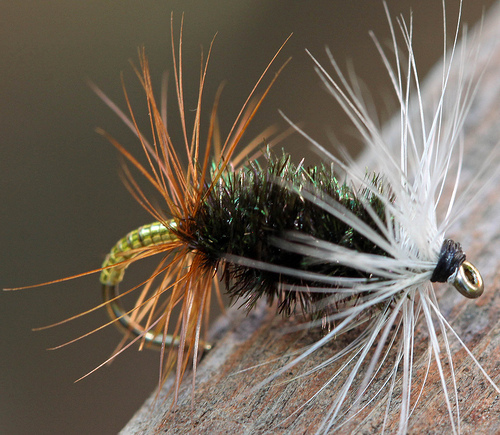 Flies are a lure constructed on a single point hook of feathers, tinsel, chenille, yarn, fur, silk, rayon or nylon thread or floss, with or without a spinner. No putty-dough baits, other natural baits or foods may be used in this area. Zone 2 From the posted sign at the mouth of Dry Hollow Creek to the old dam in the lower end of Campground 3, only flies are permitted. In the area of Zone 2 designated as catch-and-release only (from the posted sign at the mouth of Dry Hollow Creek to the posted sign below the bridge on Hwy. F) trout may not be possessed and must be returned to the water unharmed immediately. This portion of Zone 2 is designated as a multiple-use area with wading and swimming allowed. Zone 3 From the old dam to the park boundary, artificial lures, soft plastic baits, flies and natural or scented baits may be used. Natural and scented baits include live bait or any other substance designed to attract fish by taste or smell including dough, putty or paste-type baits. Experience the finest in casual dining and take in a breathtaking view of the park at the Roaring River Restaurant, located inside the Emory Melton Inn and Conference Center. The restaurant offers a wide variety of delicious entrees in a rustic atmosphere. Full-service breakfast, lunch and dinner are offered. In addition to restaurant service, they provide specialty catering for events such as weddings, parties, banquets and family reunions. Stay in Emory Melton Inn, a stunning facility consisting of large, elegant, yet comfortable rooms and suites. The rooms are decorated with rustic flair and a few feature a spectacular private balcony view of the river valley below. Rooms are available March through October. Reservations are required. The park also offers rustic cabins, duplex and fourplex units. Cool off in the park's swimming pool, located across from the park office. It is open to park visitors for a nominal fee daily from Memorial Day weekend to mid-August and on weekends from mid-August to Labor Day. For hours and more information, please call 417-847-2330 or visit the concessionaire's website. You can attend regularly scheduled nature programs every day during the summer season and weekends during spring and fall seasons. Morning and evening programs include slide shows and movies, nature hikes and much more. Contact the park naturalist at 417-847-3742 for information regarding interpretive programs. 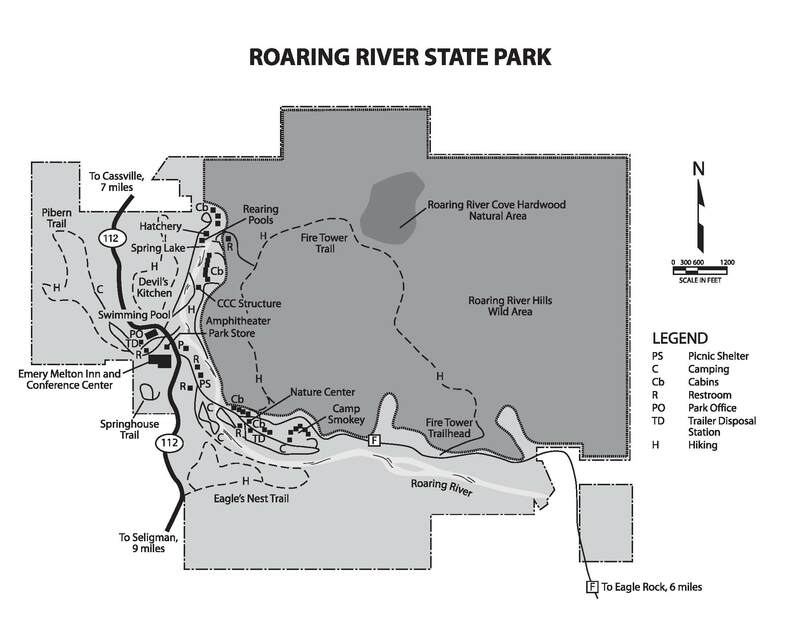 Roaring River State Park offers basic, electric and sewer/electric/water campsites. On-season (Feb. 25 through Oct. 31) services include reservable sites, a dump station, showers, water and laundry. Campground 1 - is open year-round. Reservations can be made for stays during the on-season. A few campsites also are reservable for stays during the off-season. Campground 2 - and Campground 3 - are open and reservable during the on-season. Reservations can be made by phone - 877-422-6766 from 7 a.m. - 10 p.m. CT seven days a week. For online reservations chick site. 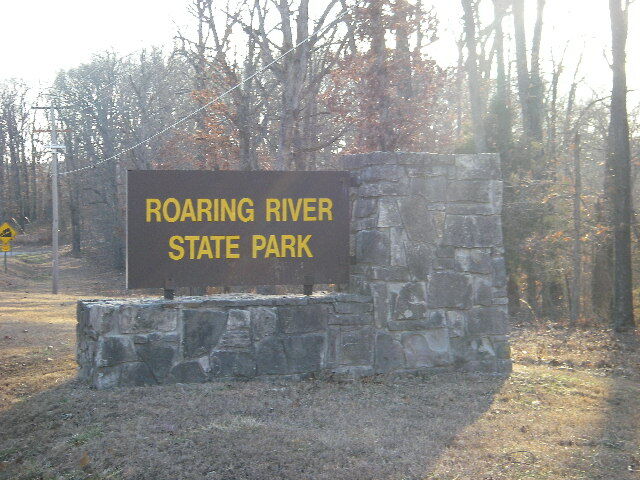 For a overview of roaring River State Park and the Roaring River area click on the picture of the park sign. Devil's Kitchen Trail (1.5 mile) - (Allow 1.5 hours) This trail�s name is derived from an odd rock outcrop that formed a room-like enclosure. This room, according to legend, was used as a hideout by Civil War guerrillas. It has since collapsed. A self-guided interpretive brochure for this trail is available at the nature center and the park office. There is also an access point near the junction of Highway 112 and the hatchery road. Eagle's Nest Trail (2.75 Miles) - (Allow 2 hours 45 minutes) This trail follows the river before ascending to one of the highest points in the park. An old homestead was located where the lilac bushes and yucca grow along the ridge. There are two additional access points; one from the top of the hill along Highway 112, and one across the bridge at the end of campground 3. Fire Tower Trail (3.75 Miles) - (Allow 3 hours 45 minutes) The old lookout tower, about 1.5 miles from the nature center, was constructed by Civilian Conservation Corp 1713 in the 1930s as an observation platform for work being done to provide material for other features in the park. The rock steps leading up the access from Deer Leap Trail were harvested in the park. Most of this trail is located inside the 2,075-acre Roaring River Hills Wild Area and passes next to the Roaring River Cove Hardwood Natural Area. This area offers rugged Ozark terrain, dense hardwood forests, open dolomite glades and deep hollows. The views from its wildflower-filled meadows remain pure wilderness. The steep mountainsides have extensive woodland belts that hide numerous stony bluffs, sheltered forest coves, springs and clear-water streams. The trail is excellent for birders and photographers. There are three trailheads and two additional access points. One of the two access points is at the nature center, while the other is off Deer Leap Trail. Pibern Trail (1 mile) - (Allow 45 minutes) This trail was constructed by Civilian Conservation Corps 1713 in the 1930s while they were harvesting material for the construction of features in the park. A variety of habitats, including both dry and moist limestone forest, tall bluffs, north- and south-facing slopes and a small Ozark stream are traversed by this trail. The access point is on the right just past the bridge before you enter a private campground. River Trail (.70 miles) - (Allow 30 minutes one way) This trail runs parallel to Roaring River between the lodge and campground. This trail was constructed by Civilian Conservation Corps 1713 in the 1930s and is an example of the trail work done by them. Wildflower displays are outstanding along the trail in the spring. SpringHouse Trail (.40 miles) - (Allow 20 minutes) This trail passes by an old homestead site with a springhouse that was used to keep food cold by using the cool spring water.